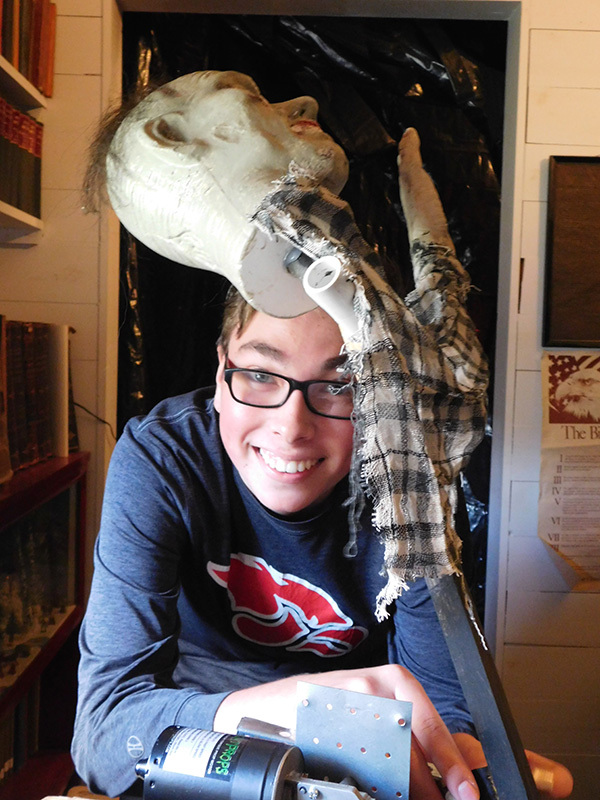 Tag Archive | "Halloween Haunt"
Nolan Patin working on one of his props for the haunted school house. Post photo by J. Reed. For 16-year-old Nolan Patin, the haunted school house at the Cedar Springs Historical Museum may take a lot of time and effort each year to create, but he loves doing it. “It’s a lot fun,” he said. This is the fifth year that the Cedar Springs Historical Museum will host a free Halloween Haunt for the community at the old Payne School. This year it will be Saturday, October 28 from 5 to 7 p.m., and again on Halloween, October 31, from 5 to 7 p.m. Admission is free. Money from each year’s car show helps to fund the event. Nolan Patin and his aunt, Marie Patin, dressing a ghost for this year’s haunted school house. Post photo by J. Reed. Nolan works over the winter and spring to sketch out his idea for the haunt, and Marie goes over the plan and details. The two then work together to shop for and collect the items needed. Nolan creates most of the props himself. One family goes through the haunted school house at a time, so they can either tone down the scariness for little ones, or ramp it up for the big kids. The haunt wouldn’t be possible without the volunteers, including Pat Patin, who helped with electrical and sound issues; Nolan’s parents, Jeff and Cindy Patin, who will provide supper for the volunteers both nights; and other volunteers including Cathy Patin, Roseann Patin, D. White, Tanya Eldred, and Nolan’s friends Danielle, Elizabeth and Shaye. Marie asked people to consider donating their old Halloween adult costumes and masks to the museum to be used in future haunts. The Payne School was built in 1860 for $600 on 17 Mile Rd, just west of Meijer. School was held there until 1970, and then abandoned. It was then donated to the museum by Cordy Wallace. They then began to raise money to move it to Morley Park. The school sits adjacent to the Cedar Springs Museum. While you plan your Halloween fun for this weekend and on Halloween, don’t forget to pay a visit to the Haunted School house in Morley Park—it’s free, family fun!